“Joan Baez was born in Staten Island, New York, on January 9, 1941. Baez first became known to the wider public as a distinctive folk singer after performing at the 1959 Newport Folk Festival. After releasing her debut album in 1960, she became known for topical songs promoting social justice, civil rights and pacifism. 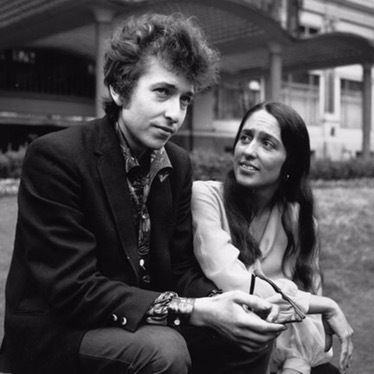 Baez also played a critical role in popularizing Bob Dylan, with whom she dated and performed regularly in the mid-1960s. 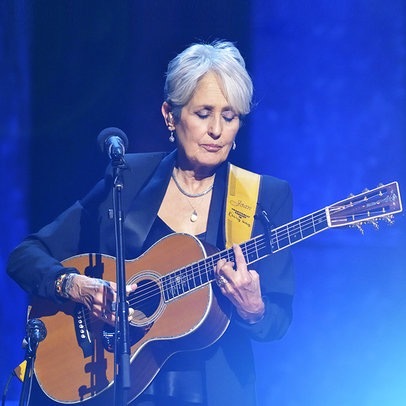 Baez’s most popular songs over the years have included “We Shall Overcome,” “It’s All Over Now Baby Blue,” “The Night They Drove Old Dixie Down” and “Diamonds and Rust.” With an enduring career, she has continued to record and perform into the 2000s. 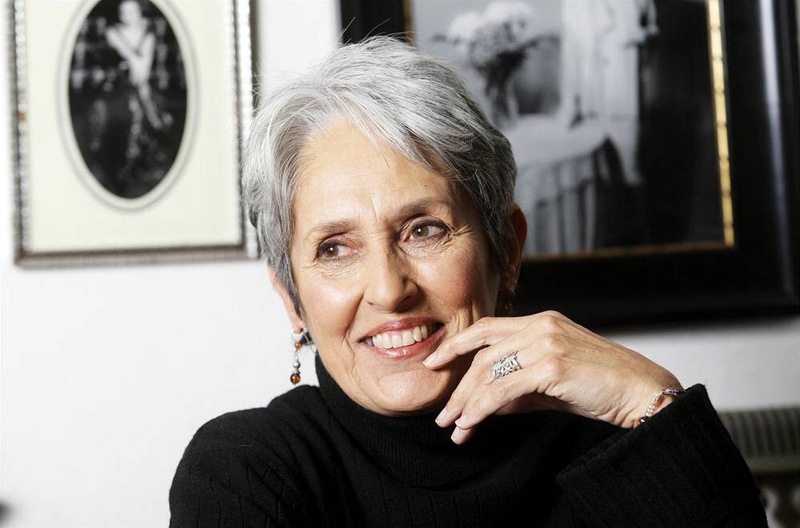 Singer, songwriter and social activist Joan Baez was born on January 9, 1941, in Staten Island, New York, in a Quaker household, her family eventually relocating to the Southern California area. Of Mexican and Scottish descent, Baez was no stranger to racism and discrimination. But that did not stop her from pursuing her natural musical talents. She became a vocalist in the folk tradition and was a crucial part of the music genre’s commercial rebirth in the 1960s, devoting herself to the guitar in the mid-1950s. Two years after her family moved to Cambridge, Massachusetts so that her professorial father could join the faculty of MIT, Baez enrolled at Boston University’s theater school, greatly disliking the experience and flunking her courses. She eventually delved into the city’s burgeoning folk scene, later citing artists like Harry Belafonte, Odetta (Baez referred to the singer as her “goddess” in a 1983 Rolling Stone interview) and Pete Seeger as major influences. 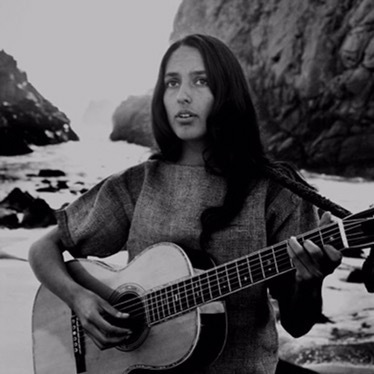 Soon Baez became a regular performer at local clubs and eventually got her big break via an appearance at the 1959 Newport Folk Festival, invited onstage by singer/guitarist Bob Gibson. In 1960 Baez released her self-titled debut album on Vanguard Records, featuring tracks like “House of the Rising Sun” and “Mary Hamilton.” Baez became renowned for her distinctive voice while receiving press billing that she would see as evoking the Virgin Mary/Madonna archetype. She released several albums during the first half of the decade, followed by more studio outings like Farewell, Angelina (1965) and Noel (1966). In addition to supporting civil rights as an artist and worker, Baez participated in university free-speech efforts led by students and the antiwar movement, calling for an end to the conflict in Vietnam. Beginning in 1964, she would refuse to pay part of her taxes to protest U.S. military spending for a decade. Baez was also arrested twice in 1967 in Oakland, California, for blocking an armed forces induction center. Baez continued to be active politically and musically in the 1970s. She helped establish the west coast branch of Amnesty International, a human rights organization, and released numerous albums, signing with A&M and branching out beyond folk. The decade also brought Baez big chart success with a remake of the Band’s “The Night They Drove Old Dixie Down,” which in 1971 became a top 10 hit in the U.K. and a top 5 hit in the U.S. In 1975, Baez released the acclaimed Diamonds & Rust, which featured the top 40 title track that delved into her relationship with Dylan. The album also offered other songs penned by Baez like “Winds of the Old Days” and the Joni Mitchell-duet “Dida” as well as a remake of a Stevie Wonder tune, “Never Dreamed You’d Leave in Summer.” She rounded out the decade with Gulf Winds (1976), Blowin’ Away (1977) and Honest Lullaby (1979). While the ‘80s and ‘90s were a time where Baez reflected on her place in a trendy musical landscape that often didn’t honor folk, she nonetheless continued to perform at benefits and fundraisers for social and political causes around the world. She also maintained her recording output with albums like Speaking of Dreams (1989) and Ring Them Bells (1995). Her first album of the new millennium was 2003’s Dark Chords on a Big Guitar, followed up by a collection of live tracks in 2005 on Bowery Songs, featuring tracks by Dylan and Woody Guthrie as well as traditional folk. Baez was honored with a Grammy Lifetime Achievement Award in 2007. Baez released Day After Tomorrow, her 24th studio album, in 2008, with the project produced by Steve Earle. Baez wed David Harris in 1968, and the two had a son, Gabriel. Harris was at the forefront of protests against the Vietnam War draft, and was jailed for some time for refusing to be drafted. The couple divorced in 1972 a few months after Harris’s release. A regular meditator, Baez has openly spoken of her dating history and went into psychotherapy for years to grapple with issues around focused relationships. “I was terrified of any intimacy. That’s why 5,000 people suited me just fine,” Baez said in a 2009 Telegraph interview. “But one-on-one, it was either completely transient—after the concert and be gone next day, and then my participation would make me sick—or it was something that I thought was real but just turned out to be heartbreaking.” Baez, having been romantically linked to Mickey Hart and for a short time to Kris Kristofferson and Steve Jobs, has increasingly made peace with her relationship history. Next #GameTheory: What is it? 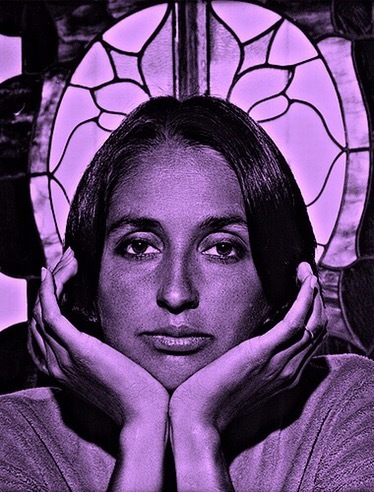 Joan Baez has meant so much to so many. Inspiration of ETHICS over convenience or popularity. To me, Joan Baeaz is all of these.